In the evenings if you want to just relax and be serenaded by the sounds of crickets and whistling tree frogs while enjoying a glass of wine , sit out on the patio and enjoy the evening concert or if you prefer, you can take a short walk across the street down to the dock and relax there or go for a swim or a kayak ride, you choose the pace. There is a bus stop within 100 yards of the house to get you where you want to go and restaurants within walking distance as well as a walking railway trail to see more of the natural beauty of the island. We had a wonderful stay in Bermuda. The people of Bermuda are so friendly. Thomas made sure if there was anything we needed he helped provide it for us, including sending a taxi to pick us up and drop us off. The apartment was very clean and supplied all the amenities. We spent time on the dock at sunset, the beach and light house were both a quick walk. Even the market was a 10 min walk along the railroad path. Thomas also picked up our bus passes which are a necessity when staying. My hope was to have a break from the busyness of life for my family, and we did. The apartment is next door to a farm so at any time you can see rabbits, chickens, pigs, and peacocks. You don't need an alarm clock because the roster will wake you in the morning. Bermuda is a beautiful place to see so there is value getting up early. This is an ideal situation if you want to be on a vacation yet have privacy, want to save a little on meals because the kitchen and market are available, and experience life in a very natural way in a remarkable environment! We are grateful for the welcome that we received and look forward to returning! Thomas and his lovely cottage are truly Bermuda gems! Thomas is a wonderful host, with arranging transportation (from/to airport; picking up bus passes for us), sharing information about island activities and places to see, both on and off the beaten path and even sharing bananas and papaya from his backyard. His food recommendations were spot-on - loved the fish sandwiches at Woody's near Dockyard and Mamma Angies in St. George. We hiked the rail trail and every nature reserve - amazing vistas of blue waters and white/pink sand beaches. We enjoyed exploring in the kayaks and relaxing at the dock. This location is perfect - easy access to the bus to go to the Dockyard or Hamilton and St. George to the east. So nice that the bus pass includes the ferry too. Our thanks to Thomas for making our first visit to Bermuda such a memorable one! Hosting a vacation rental can raise ones blood pressure but I can truly say that your visit was not one of those instances. It was a pleasure have you to stay at the cottage and enjoy Bermuda and I hope that I will be graced with your company again in the future. The Coral Point Cottage was a haven of peace and convenience for us on the beautiful island of Bermuda. Thomas was a wonderful host, greeting us and orienting us when we arrived. The location is perfect for exploring the natural and cultural wonders of the island, and we loved scootering and bussing around it especially in the off season, without all those pesky tourists. We swam and snorkeled most days, including New Year's. The locals think we're nuts, but it's about as warm as Lake Michigan in July. Thanks, Thomas. We hope to return someday. God bless! I always stop to think of an appropriate response to a review because it must be thoughtful and honest. Joel and Anna were funny, warm and memorable guests. They represent all that I look for as a host and have no hesitation in looking forward to a future visit. This was our first time visiting Bermuda and we fell in love with this country and the people. Coral Point is a perfect cottage for your Bermuda vacation having all the necessary amenities that you'd need for a stay away from home. The quality of the cottage was impeccable and a lot of effort was given to make the stay memorable for the guests. Thomas has been extremely helpful right from the beginning and gave us all the necessary information to kick start our Bermuda vacation. He went above and beyond with his hospitality and bought us Bus-Passes for using the public transit in Bermuda. We were able to use the bus and ferry service with the 3-day passes, and it made our life so easy without having to bother about having exact change for tickets. We will definitely recommend Coral Point for any future Bermuda vacationer and also a shout out to Thomas for being a perfect host. I had to pause before replying because it is sometimes difficult to convey the relationship that develops between a host and a guest. with fewer attractions open so the challenge was to entertain with a rewarding Bermudian flare. 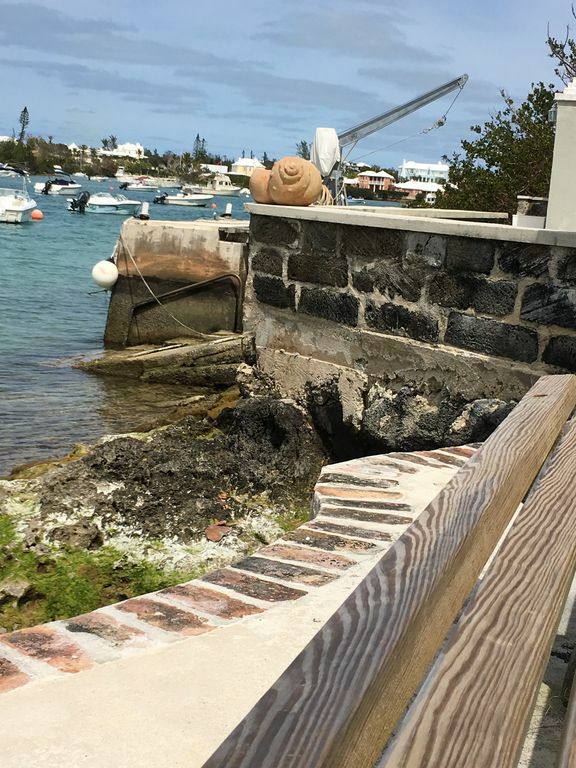 I hope the memories last a lifetime and Coralpoint Cottage doors will always be open to have them back to relive the visit and to discover new Bermudian memories.